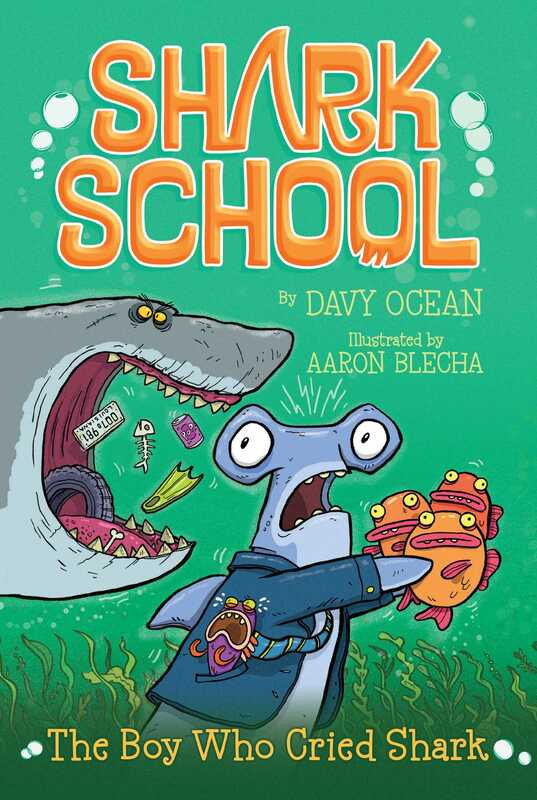 When Harry Hammer accidentally sounds the great white shark alarm a few times too many, he ends up in dangerous waters in this fourth Shark School (mis)adventure. Harry Hammer’s all-time hero is the great white shark Gregor the Gnasher. Gregor is a famous action movie–star and the Underwater Wrestling Champion of the World. But not all great whites are like Gregor—most are fierce creatures of the deep. So when Harry sees one near Shark Point, he sounds the alarm and everyone panics! Turns out it’s just an old basking shark, and now everyone is furious. After a couple more minnow-sized mistakes, Harry sees a REAL great white…and it’s very hungry. Will anyone believe him this time? Out of my room . . . Into the hall . . .
“Sorry, Puddles!” I call back as I crash into our moth-eared catfish, sending him spinning out of control and bouncing into the wall. I don’t stop to find out if he’s all right. I must get to the jellyfishion before Mom and Dad! It’s Saturday night, and if I don’t get there RIGHT NOW, they’ll put on the news or some terrible sappy movie. They’ve been washing the dishes while I’ve been cleaning my room. There’s always a rush to get to the den first after dinner, but tonight I have to get there first. So, instead of doing a total cleanup, I used my tail to sweep the mess under my bed. If Mom doesn’t look too closely, I might just get away with it. I come to the end of the hall, hook my dorsal on the doorframe, spin sideways (so my goofy hammery head doesn’t get stuck in the door), and then-WHAM!-I’m in the den. Before Mom and Dad. YES! -down on the on button. With a shiver and a fizz, the jellyfishion comes to life and I left-hammer the three button, just in time to see the judges for The Shark Factor being introduced. Pumping music blares and lasers burst across the stage, lighting the huge undersea set. The announcer, with his big, booming whale-size voice, waits for the pumping music to stop and then shouts out the names of the judges as they appear. That’s Paddy Snapper, the saltwater crocodile from Emerald Island. He slithers down the ramp on his yellow belly. That’s Ellie Electra, the smooth-bodied electric eel with ultra-shiny skin. She shimmies down the ramp and wraps herself around Paddy. That’s Bobby Barnacle, who is so tiny, he slides down the ramp under his own personal magnifying glass so that everyone can see him. And lastly, it’s Marcus Sea-cow, wearing his trademark leather pants. He waves his pink tail at the audience, and with ocean-size smiles the four judges float to their huge clamshell seats. I look around at the sound of Dad’s voice. He and Mom are swimming in from the kitchen. I grip the remote control tightly. “I was hoping to catch some of my interview on the news,” Dad says. Dad is mayor of Shark Point, and there’s nothing he likes better than seeing himself on jellyfishion. Most weeks I wouldn’t have minded. I mean, there are only so many times you can watch a fish being told he sings like a ship’s horn that’s got a seagull stuck in it. But this week . . . oh, man . . . this week I have to see the special guest who’s opening the show. We’ve been talking about it all week at school. Me, Ralph (my pilot-fish friend) and Joe (my jellyfish pal) have been finding it really difficult to concentrate in class. In the end, our teachers had to ban anyone from even mentioning The Shark Factor. “Why?” she says, looking puzzled. My stomach is doing little flips just thinking about it. Gregor the Gnasher is a great white shark and my number-one hero. Not only is he the Underwater Wrestling Champion of the World (signature move: the fin-chop with tail-driver), he’s also an action-movie star and now he’s breaking into the music business as a rapper called G-White. Tonight’s performance has been the talk of the interwet, and the number of ‘GREGOR’ fan pages on Plaicebook has tripled in two days-making the system crash. Marcus Sea-cow floats up from behind his desk. Horns ring out across the stage. Then comes the beat of drums. Search-lights start flashing through the water. A huge, glittery curtain opens at the back of the stage and there’s Gregor, floating fin-high on a column of bubbles. Two dolphins wearing shiny dresses are dancing on either side of him. Around his neck is a big gold shark’s tooth, hanging on a gold chain that’s so thick, it looks as if it came from the anchor of a cruise ship. He’s wearing a red Shike tracksuit with diamond-encrusted sneakers on each fluke of his tail. The audience has gone crazy. I sneak my tail toward the remote to turn the volume up. Sea-cow, Barnacle, Electra, and Snapper float up above their judges’ desk and start clapping along. G-White nods to the beat as the dolphins sway beside him. “I’ve got a big bite cuz I’m a great white,” he raps. I have to put my fin across my mouth to stop myself from squealing like a girl-shark. “Great white!” the audience shouts back to him. “Great white!” I join in with the audience. “He’s not too bright, he’s a goofy great white,” Dad mutters. I turn around and glare at Dad. He’s shaking his head as he looks at the screen. But they won’t clam up. “Bite it? Is that all he can sing about? Being mean? I don’t think that’s a very good example to be setting for the youngsters of Shark Point,” Dad says in his “serious” voice. “Gulp in ONE BITE, cuz I’m a great white!” screams G-White from the jellyfishion. Mom and Dad just look at me. I’m torn. I just want to listen to the song, but I feel like I have to defend Gregor. He is my hero after all. I want to be like him. Even if the only thing I could gulp with one bite is a minnow. Actually, I couldn’t even manage that when I met Marmaduke the Minnow, my new friend. That doesn’t matter, I tell myself. I have to convince Mom and Dad that G-White is a good shark now. I open my mouth to continue the argument, but Mom holds up her fin. “No, Harry. I’m sorry,” Mom grabs the remote from my fin and flicks the jellyfishion channel. Oh no! It’s Drownton Abbey! Two terribly fancy crabs are having a terribly fancy conversation, while doing some terribly fancy kissing, in the terribly fancy drawing room of a TERRIBLY TERRIBLE COSTUME DRAMA! I can tell that they’re not going to let me see the rest of the performance. The thing I’ve been waiting for the whole entire week is ruined. I swim up from the chair and swish out of the den, slamming the door behind me. I go straight to my room and throw myself onto the bed. “It’s not fair!” I shout, with a couple of prickly tears in my eyes trying hard to get out. I wipe them away with the tips of my fins. Then I beat my fins on the bed. Barrap! Barrap! they go as they hit the seaweed blanket. Actually, that’s not a bad beat. Thud. Thud. Swish! goes my tail. That rhythm’s pretty good, I think to myself. Suddenly, I feel a little bit better. Maybe I’ve discovered a cool new talent. Maybe I’m not so different from G-White after all. I mean, he’s a huge great white wrestling, movie, and singing star, and I’m just a little nobody hammerhead, but what if I can rap too? Barrap! Barrap! go my fins. Swish. Thud. Thud! goes my tail. “I’m a hammerrrrrrrrrrrrhead. And that’s a bit bad actuallyyyyyy,” I rap. I try again. A little faster on the barraps this time. No, I’m not. I’m never red. That’s just really silly. I need something better that rhymes with hammerhead. Lots of cool things rhyme with great white. That’s why G-White’s rap sounded so good. I have to think . . . .
That is clearly the worst rap in the history of the world. Ever. And then I hear someone laughing. I look up from the bed, and see Larry, my lantern-fish night-light, and Humphrey, my humming-fish alarm clock. They’re both rolling on the floor, clutching their sides and giggling like crazy at my dorky attempts to rap like G-White. “Are you sure?” asks Humphrey, buzzing away happily. Larry and Humphrey help each other off the floor, both trying-and failing-not to laugh. But I can still hear them giggling as they swim back to the shelf above my bed. Great. I bet G-White’s alarm clock and lamp don’t ever laugh at him. Sometimes it really stinks being a hammerhead shark. Sometimes it’s even worse. And then there are days like today, when just about everything goes wrong and it’s worse than worse can be. As I drift off to sleep, I hope that some day I’ll finally get to meet Gregor the Gnasher. If I met Gregor, he could show me how to wrestle, or act, or rap . . . .
Then no one would laugh at me. I bet he could teach me stuff that would blow Larry and Humphrey and my mean parents out of the water! But until then, I’m just going to be a dull hammerhead-that NOTHING COOL RHYMES WITH!